The Missive Maven: Last day to sign up for Swap-bot Cat Postcard swap! Last day to sign up for Swap-bot Cat Postcard swap! Okay, so tomorrow is really the last day, but I doubt I'll be doing much blog posting between now and then, so better early than late. To recap...I'm hosting a Cat Postcard Swap on Swap-Bot. There's a little more info in a recent blog post, too, but the last day to sign up for the swap is TOMORROW (Friday), November 20. I'll assign partners on Saturday, November 21, sometime in the morning or early afternoon, and then the mailing deadline is the following Saturday, November 28. 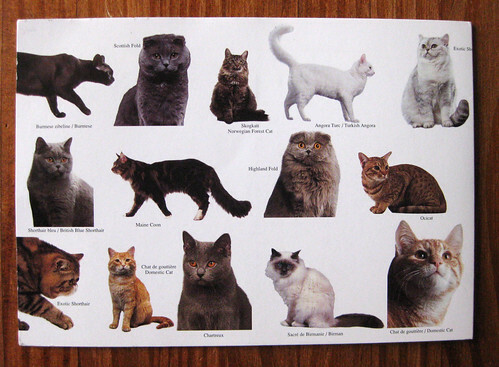 The front of the postcard must include a cat or cats as its prominent focus. Also - equally important - on the back you must write a little bit about a cat or cats. You can write about your cat or cats you own now, ones you owned before or grew up with, copy a short poem about a cat, or talk about the awesome cat that hangs out in your favorite bookstore. Any cat-related prose will do! I'm just looking to "double" the cat theme, and also ensure that no one gets a postcard with no writing on it. I hope you'll join up - lots of kitty postcards pawing through the mail should be great fun! I am exceedingly excited that this is one of the top 10 swaps on swap-bot right now - as I write this, it's at #3. Since it's been in the top 10, numbers have risen dramatically - wow! Way cool. One more day for cat postcard swaps, round 2! Cat Postcard swap - go!